Bolivian President Evo Morales has narrowly lost a referendum to allow him to stand for a fourth term in office, exit polls suggest. One poll suggests 52.3% voted against the proposal to amend the constitution, while another suggests it was 51%. However, Evo Morales’s deputy has predicted Bolivia’s first head of state of indigenous origin could still win, as official results trickle in. The constitution change would have let Evo Morales remain in power until 2025. Opposition supporters have been celebrating the referendum result in parts of the main city, La Paz. Evo Morales, an indigenous Aymara and former coca leaf producer, took office in January 2006 after being elected for the first time in 2005. He won a referendum in August 2008 on whether he should stay in office, and then a few months later a referendum approved his plans for a new constitution. He was re-elected for a second term in 2009. In 2014, Evo Morales was able to run again despite the 2009 constitution limiting presidents to two consecutive terms in office. The Constitutional Court ruled his first term should not count because it had not taken place under the new constitution. His current terms ends in 2020. Evo Morales is still a popular leader and the economy has grown steadily over the past decade. However, many thought he should not be allowed to serve 19 consecutive years as president. Opposition leader Samuel Doria Medina urged Evo Morales to “recognize the results” and focus on solving Bolivia’s problems in his remaining time in office instead of trying to run for another term. However, Vice President Alvaro Garcia Linera said the results so far were a “technical tie”. He urged people to wait for the official results and said any celebrations by the opposition were premature. Vote counting has been slower than usual. The electoral authorities say the delay is affecting mostly ballots from rural areas, which largely support the president. In the eastern province of Santa Cruz, angry voters set fire to ballot papers and ballot boxes after a delay to the opening of several polling stations. Despite a drop in the international price of oil and natural gas, the Bolivian economy has performed well in the past 10 years, growing on average 5% a year. The government’s socialist policies have also been successful in reducing extreme poverty. However, recent allegations that Evo Morales used his influence to favor a Chinese construction company in Bolivia have damaged his approval ratings. A former girlfriend of Evo Morales, Gabriela Zapata, holds an important position in the company, CAMC, which has secured more than $500 million in contracts with the Bolivian government. 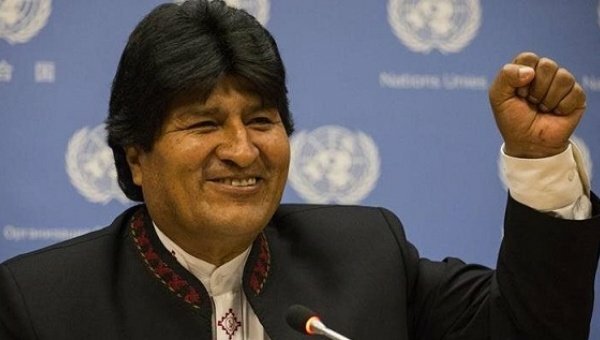 Evo Morales rejected the allegations and said he had nothing to hide. He ordered an investigation into how the contracts were awarded.